The Battle of Stralsund was a battle of the Thirty Years' War, fought starting July 5, 1628, between the Holy Roman Empire and an alliance of the Swedes, Scots, and the inhabitants of Stralsund. The battle began when the Imperialists under Albrecht von Wallenstein besieged the port of Stralsund. 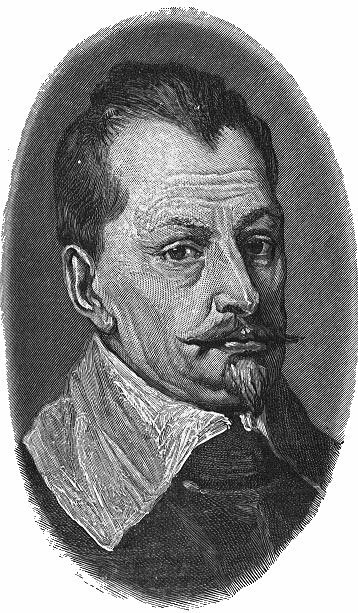 General von Wallenstein swore to take the port in three days. The port was defended mainly by the inhabitants, aided by a small garrison of Swedes and Scots. After a siege of eleven weeks, Wallenstein was compelled to withdraw his troops from the port with heavy casualites. On May 13, 1628, the siege proper was begun by Arnim; and, after two attempted assaults had failed, the Scandinavian reinforcements arrived. It is clear that without their aid Stralsund could not have held out against her besiegers. First came an auxiliary force dispatched by Christian IV, under the command of Colonel Henry Holk, and consisting of Major Munro's regiment of 900 Scots and 400 Danes and Germans; then followed eight Swedish ships, with 600 soldiers and a diplomatic agent, who on June 23 concluded on behalf of his King a treaty of alliance for twenty years, the basis, as it proved, of Gustavus Adolphus' subsequent expedition. The city was sufficiently garrisoned, and Arnim in vain essayed both assault and bombardment. By June 23 Wallenstein himself assumed the conduct of the siege, and massed round Stralsund an army amounting to 25,000 men, in addition to the 6000 (or thereabouts) on Rügen. In a preliminary interview with Arnim at Greifswald he had declared his determination, negotiations or no negotiations, to make short work of the canaglia in Stralsund; and to the time of his actual appearance before Stralsund seems to belong his famous vaunt, to which Munro's narrative bears testimony,that the city "must down, were it bound with chains to the heavens." superabundance, as Council and citizens were not slow to feel — and on July 19 they ventured on a sortie, which however proved unsuccessful. Wallenstein's opportunity had passed away; his attempts to circumvent Stralsund by negotiation and to crush her by force had simultaneously broken down. It was impossible any longer to keep the Imperial forces massed round the place; on July 21 the withdrawal of the army began, and by the 24th the siege had to all intents and purposes been raised, though Arnim remained with the army no further off than Brandshagen. Christian IV had the satisfaction of bidding the unfortunate Bogislav clear his duchy of the Imperialists, and of taking Wolgast by a coup de main (August 3). But Wallenstein rapidly swooped down upon the King with a force of 12,000 men, and, defeating the troops which he had landed, drove him back to his ships (August 12). Before the end of the autumn Wallenstein himself quitted Pomerania.